Q: What kind of workout is this? 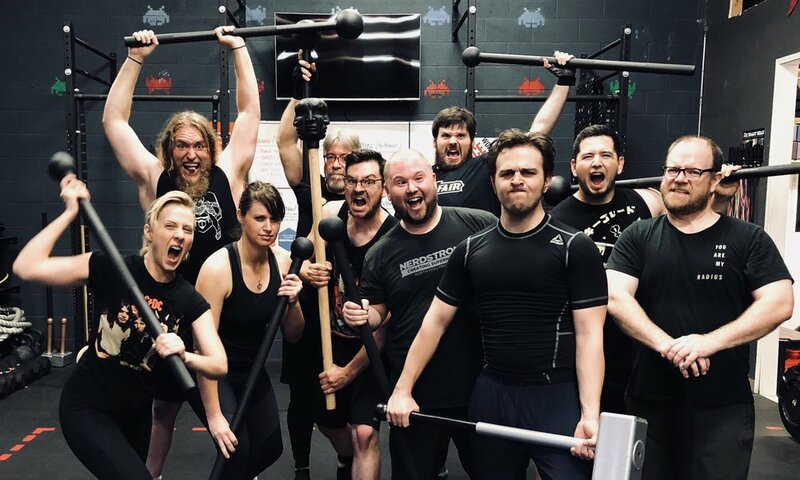 A: Nerdstrong workouts are a combination of bodyweight, barbell, kettlebell, cardio (rowers, skiers, bikes) and varied intensity movements compiled into fun and collaborative workouts for people at all levels of fitness, with small classes and hands-on coaching. No treadmills. EVERYONE IS WELCOME! A: Hands for high fiving. Bring a water bottle, closed-toed athletic shoes and clothes you're ready to workout in. Q: How many days a week should I attend classes? A: Nerdstrong recommends that our heroes attend at least twice a week in the beginning. After that, your journey is yours to undertake. Some heroes attend everyday, but vary their intensity. Some keep to a strict schedule based on their livelihood and fitness level. Need help, always ask for help! We're always here. Q: What should I expect for my first class? A: You should expect it to be challenging, but don’t worry, everyone’s first class was. Don’t be surprised if your muscles are a little sore for the first couple times; this will pass after second or third class. Nerdstrong does not tolerate racism, sexism, homophobia, transphobia, body shaming or oppression of any kind. Nerdstrong welcomes all bodies, genders, races, nationalities, faiths, classes, sexualities, sizes, ages & abilities. All of our facilities (bathrooms/showers) are individual. There are no group bathrooms, showers or changing areas. Q: Why is Nerdstrong different? A: At Nerdstrong, we pride ourselves on being positive. There’s no barking orders at you, no yelling. Instead, we provide an amazing community, a great workout and highly-trained coaching nerds. Q: What makes this nerdy? A: Our nerd/geek comes from the heart of the gym: its members. We are nerds. We are geeks. We love scifi, comics, math, science, cosplay, books, movies, TV, pop-culture, RPGs, computers, video games and board games. The atmosphere and workouts in the gym are geek and nerd-themed, and we create a welcoming and inclusive environment for all. 2) Attend your first free class or DROP-IN. 3) Have questions? Ask me and I can help you start your fitness adventure. Q: Is personal coaching available? A: Yes! We have personal/private coaching available.